Departure from Alagna, cross the only bridge on the ring road, near the carpentry. The route partly coincides with the winter cross-country ski track. Carry on along the river on a relatively wide path, on pebbles left behind by past floods of the river Sesia.  Past Balma di Riva Valdobbia, you can go up to the Isolello bridge, protected by the avalanche shelter, crossing mixed soil, among broad-leafed or larch woods and green meadows, making up a total length of about 5km. Suitable for everyone, the use of a safety helmet is highly recommended especially for the youngest participants. From here the trail continues or on the highway fine to Otra Sesia, where you take the iron bridge that crosses the Sesia’s river leading to the village, or through Isolello, where the path narrows, becoming rough and challenging. Continue downhill between mountain slopes and the riverbed. A trail alternating between woody and muddy paths runs for about 1 km before passing through the hamlet Rusa to reach Campertogno. At this point a 6 km ride of "forest road" - at times paved - where there is a residential area like the one in the picturesque village of Quare. The route becomes much smoother between Piode and Scopa, crossing woods, fields, small hamlets and charming stone bridges.From Molino di Scopa proceed holding the left orographic bank , and then switch back on the right bank and arrive to Balmuccia.